Conquer each day with the capability and rugged good looks of our 2017 Ford F-450 Platinum Crew Cab 4x4 in Shadow Black. Powered by is a 6.7 Liter Power Stroke Turbo Diesel V8 that generates 440 and 925lb-ft-of torque. It's paired with a TorqShift 6 Speed Automatic Transmission as well as adaptive steering, and will impress you with its potent power and surprising agility. 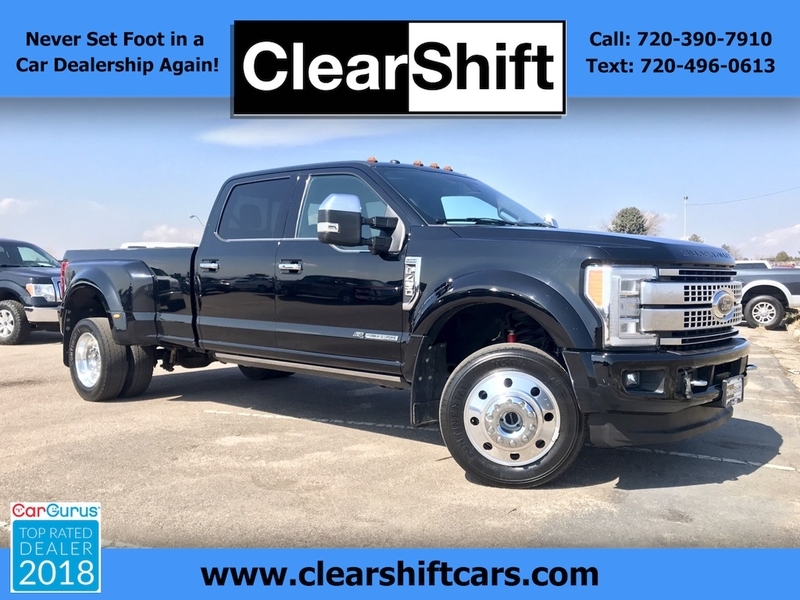 This incredible F-450 delivers security and peace of mind with a rear view camera, lane departure warning, blind spot monitor, rear parking sensors, anti-lock brakes, airbags, stability/traction control, trailer sway control and hill start assist. With a comfortably smooth ride, massive power, and an accommodating cabin, our F-450 is more than capable of doing your heavy lifting! Print this page and call us Now... We Know You Will Enjoy Your Test Drive Towards Ownership!